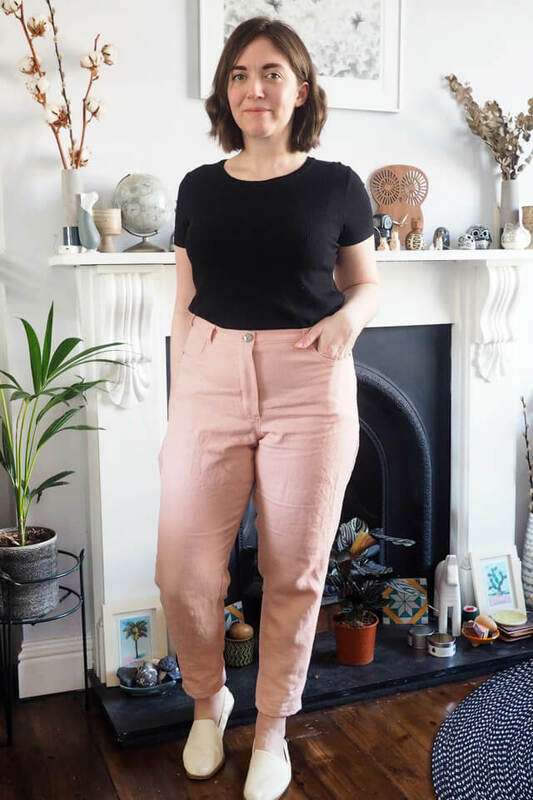 The style of these trousers is based on a pair of very much loved ready-to-wear mom jeans from Monki. 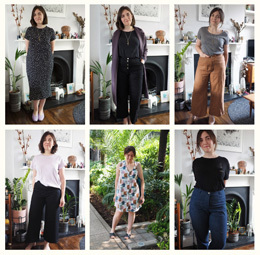 ‘Mom’ style refers to the somewhat 80s aesthetic combo of high waist, loose fit through the hips, tapering to a ankle-length slim calf – a shape I think works pretty well on my pear shape but is difficult to find a good fit in the shops. My Monki jeans were made out of a rigid denim and I was forced to admit that they’d become just a shade too tight to be really comfortable. 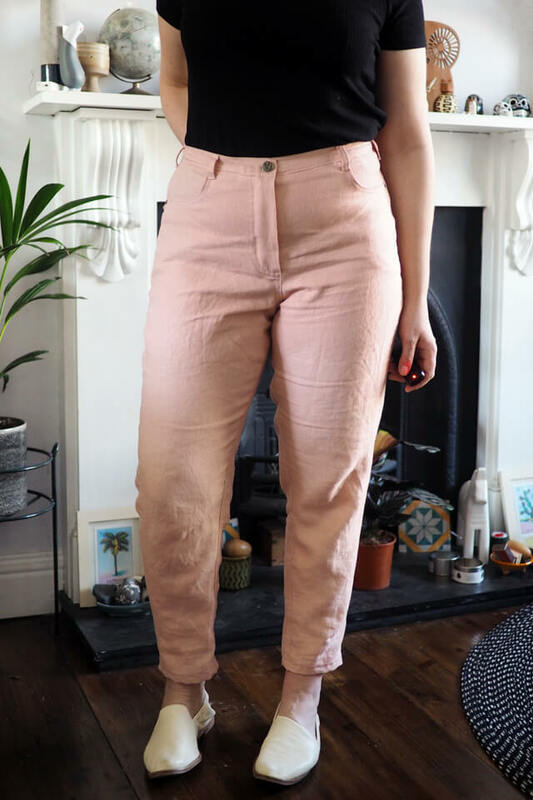 I haven’t seen a single commercial sewing pattern for this style so made the decision to sacrifice my jeans by cutting them apart to draft my own pattern. The rubbing-off process was pretty straightforward: I seam-ripped the waistband and crotch apart then carefully cut close to the main seamlines to open up the legs. Then I pressed everything flat and traced all the pieces onto dot and cross paper. I slashed and spread a little to add in extra width where needed to make them actually fit again, trued up all the adjacent seams then finally added grainlines, notches and seam allowances. 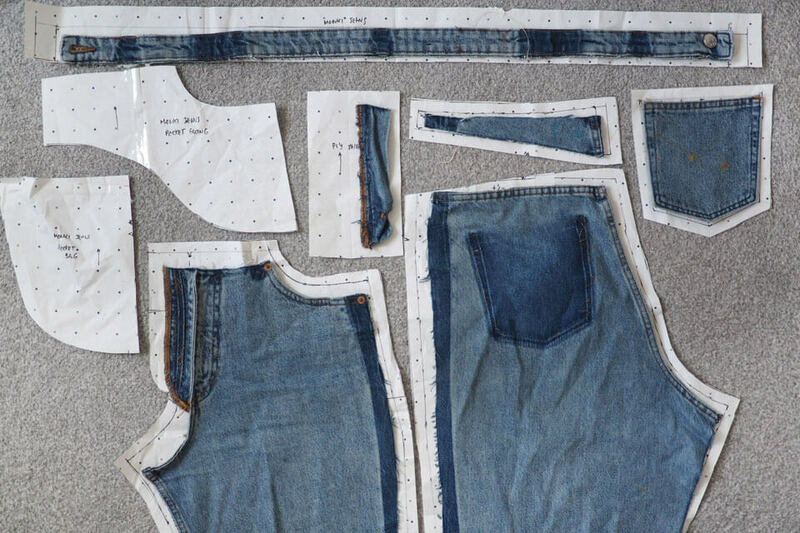 Some pieces like the pockets were easier to draft off the tracing rather than the original jeans. It was all pretty intuitive, though you could check out this Craftsy class if you wanted to learn how to do it properly! 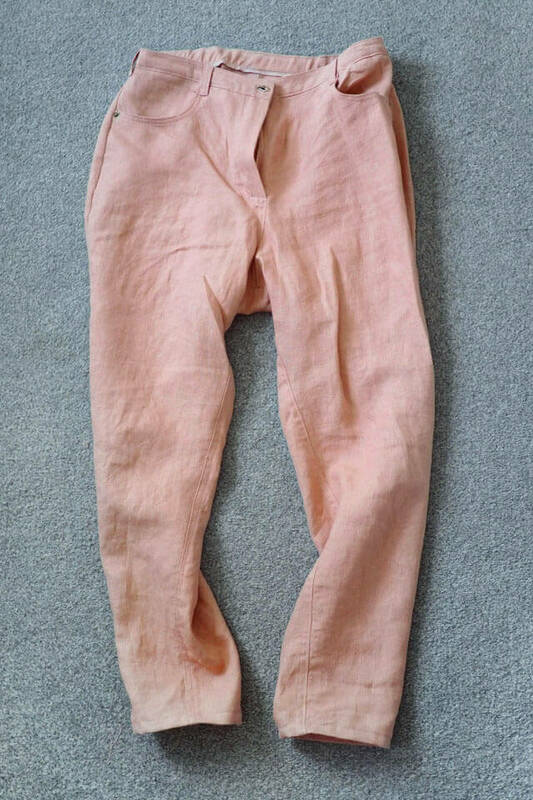 Having made loads of pants I could retrofit the construction method easily using standard techniques. I did a lot of baste-and-try as I went to make sure my drafting was working out okay. Generally I did a pretty good job on the fit but annoyingly I made a mistake adding width into the back yoke as it turned out huge and gape-y in the small of my back. I did my best to fix it but it’s left a few irritating puckers along the yoke seam. Additionally when I use this pattern again I’ll take some height out of the centre back as it’s wrinkling a bit horizontally too. But eh, linen wrinkles anyway so it doesn’t show up too much. 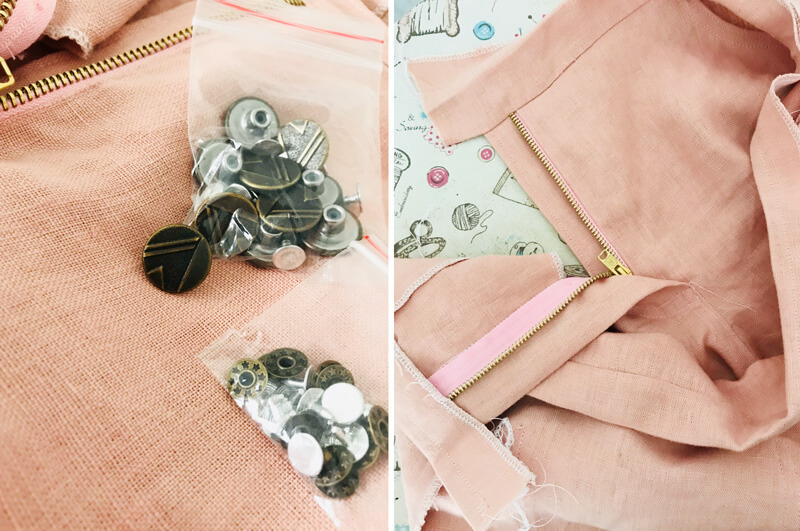 I used a heavyweight blush pink linen from The Fabric Store, which they kindly sent to me. I think this is the first linen I’ve got from TFS, which is silly since along with merino knits I think it is what the store is most well-known for. They have many different weights and get beautiful trend-forward colours dyed just for them (the dreamy Caper shade has been a big hit in blogland, and I have my eye on it too…). In fact I have barely sewn with linen at all generally. I think I’ve always been put off by the wrinkles and that it’s always felt both a little rough yet delicate and loosely woven to me. I’m glad to find that so far, my fears were unfounded. It was great to sew with, a little lighter weight than the usual denim I use so helped to assuage any bulky seams. My only concern is that it’s rather loosely woven and frayed quite a lot as I was working, so I really hope it holds up to plenty of wear. All the major seams are overlocked and faux-flat-felled, and I think the flax fibre is stronger than it seems so my worrying may be unfounded. There are lots of details that I poured extra time into, which I had a lot of fun planning and sewing. 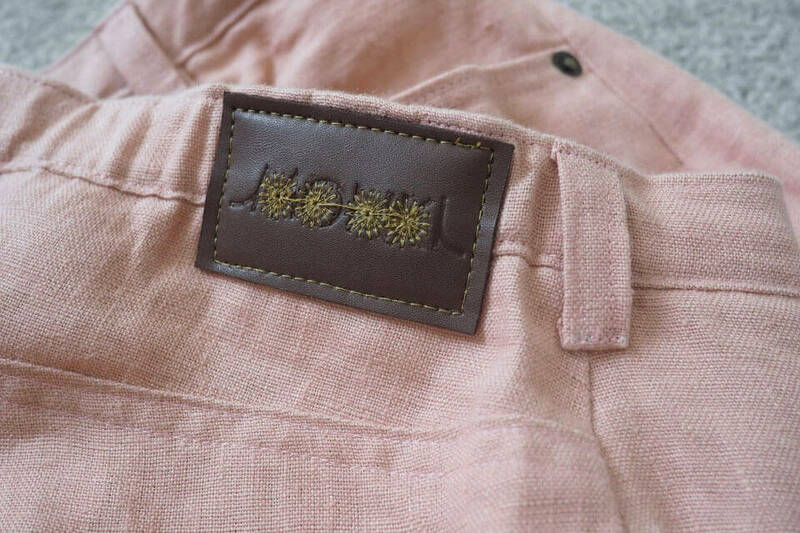 Despite being made of non-denim I wanted them to definitely read jeans rather than chinos, so added all the usual detailing: double topstitching across the seams, fly topstitching, and nice metal hardware. 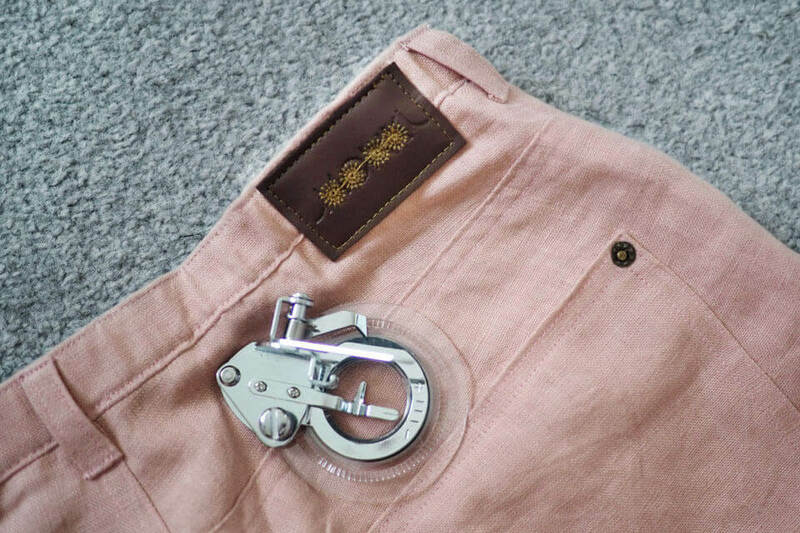 I love the sturdy pink and brass zip and the fun jeans button and rivets, all from eBay. 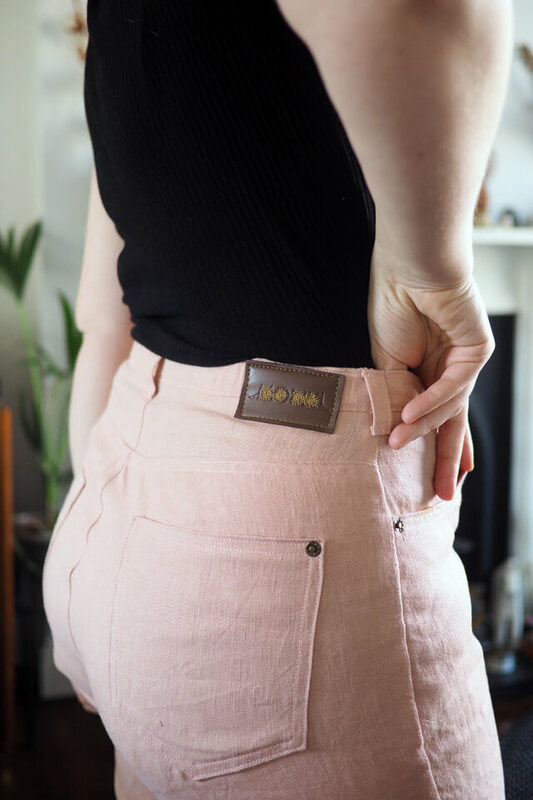 I think this is my favourite bit: I picked off the original back waistband label, machine-embroidered stars over it with my daisy foot and sewed it back on. I like the reconstructed nod to the source garment and it also helps give these that proper jeans-y look. I got the daisy foot for Christmas last year and it’s the first time I’ve used it, it’s great! 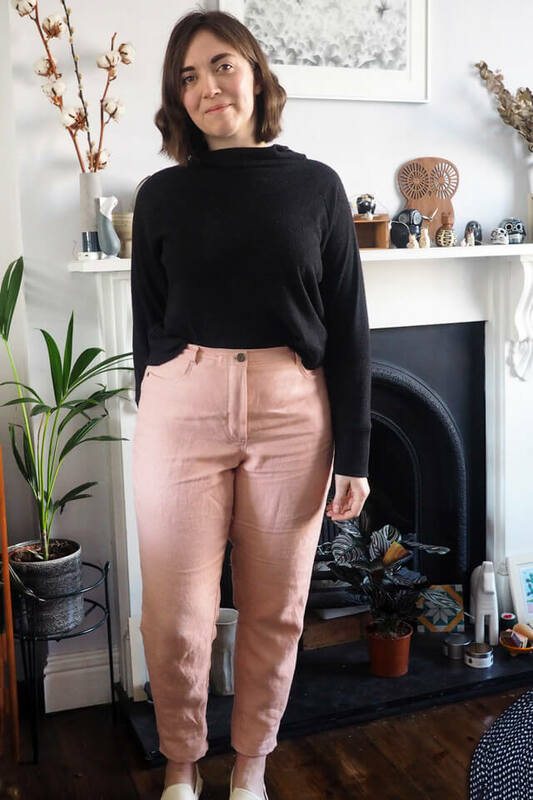 Pink jeans might not seem like a capsule wardrobe essential, but this colour is pretty much a neutral to me these days. In fact I thought I’d have to wait until spring to start wearing them but they pair really well with sweaters (RTW and Toaster above) and I don’t really feel the cold too much anyway so I can start wearing them right away! 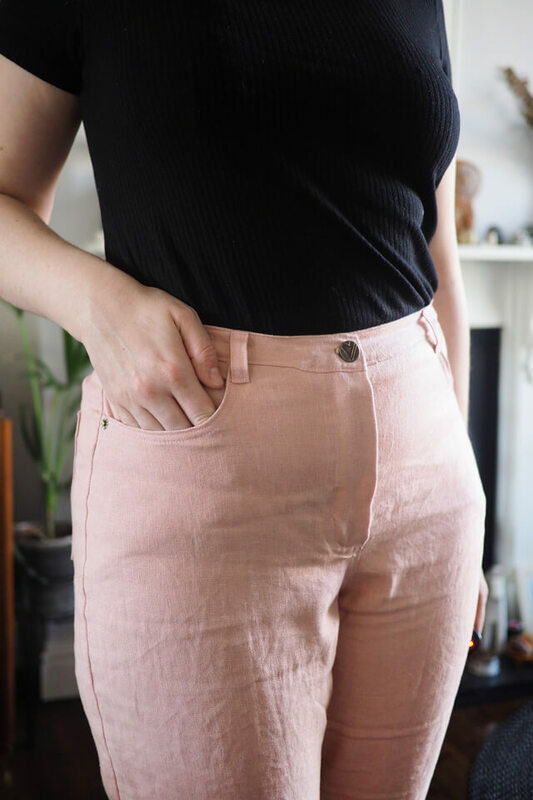 These jeans feel amazing to wear, amongst the most comfortable and well-fitting I’ve made/worn, and they were an absolute joy to sew, from drafting to hammering in rivets. Overall they took about three weeks of leisurely sew-time which I think is a good benchmark to aim for in my slow sewing going forward. I can’t wait until spring really kicks in when I’m sure they’ll get worn to death with tees and sandals. 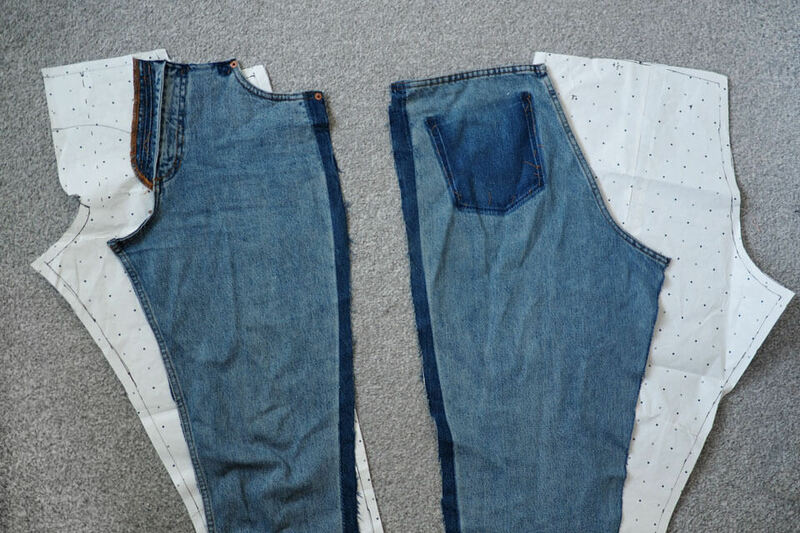 I’m definitely going to use the pattern again to make a classic indigo pair next – I have some selvedge denim on the way already. 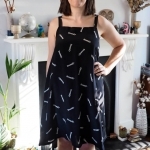 Have you self-drafted or rubbed off favourite clothing? I think it’s quite addictive! Those are just lovely, and the fit looks great. My entire closet seems to be black, navy and khaki right now–it’s so nice to think of dressing for spring! I’ve worn more colour than usual this winter, I think the dark days need a bit of brightening up! They are perfect, the fit, the colour! Lovely !! Nice! I’m always impressed with the commitment to see a pattern through from picking apart the old pair through to the detail on the leather patch. You inspire me to give it a go! Thanks! It was really fun so didn’t feel like too much work. These look fab. Gorgeous colour and such a lovely fit. 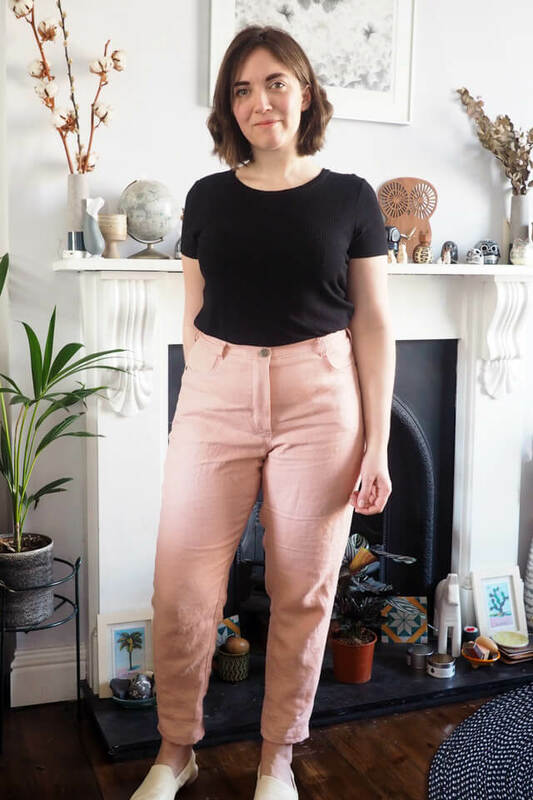 I have ripped up and un-picked a pair of my favourite jeans when they finally wore out but just not got around to sewing up a new pair – you have inspired me to give it a go! I procrastinated before getting going too, but I found the drafting process really fun in the end. 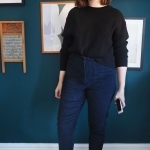 Great blog post and your jeans look amazing. Well done. These look terrific on you. I agree it is surprising that no one has done a pattern for Mom jeans. I have a top shop pair that are incredibly comfortable and surprisingly flattering — every time I wear them both my husband and my 16 year old grandson say I look great! 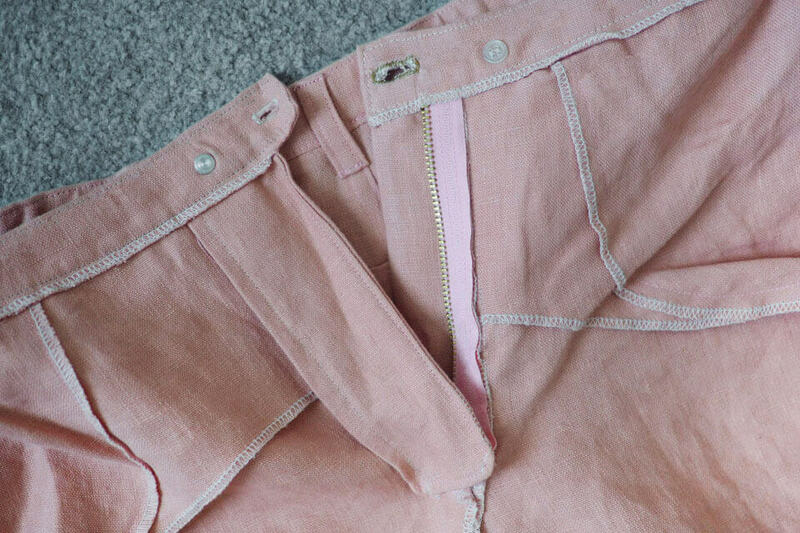 I love Your pink linen — you’ve inspired me. You’ve done a fabulous job on these and I love the fact that they are in pink linen. Look forward to seeing the colour calked ‘caper’. Good Job! These jeans look great on you. 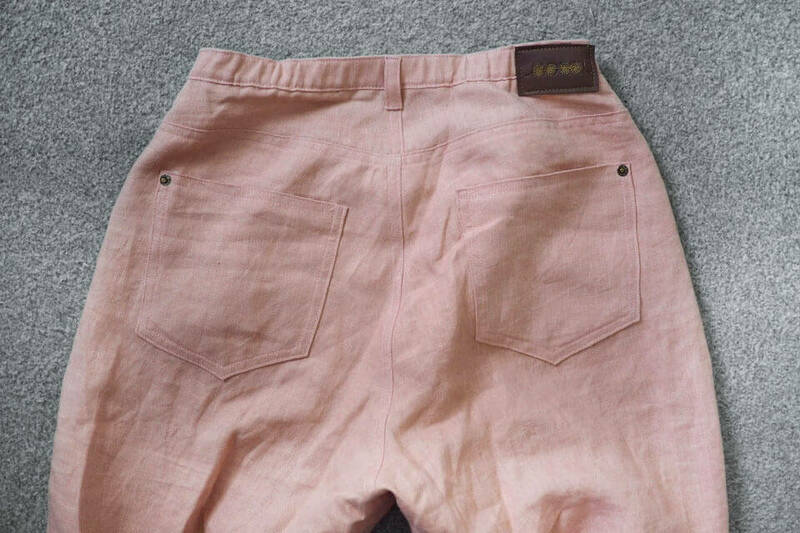 Seeing the photos towards the end illustrates your statement that the pink jeans are a neutral/basic in your wardrobe. Great point. Thanks! Yes they pair will with a lot of my tops, I especially like pink with dark reds and greens. Wow these are fabulous! Look so professional! 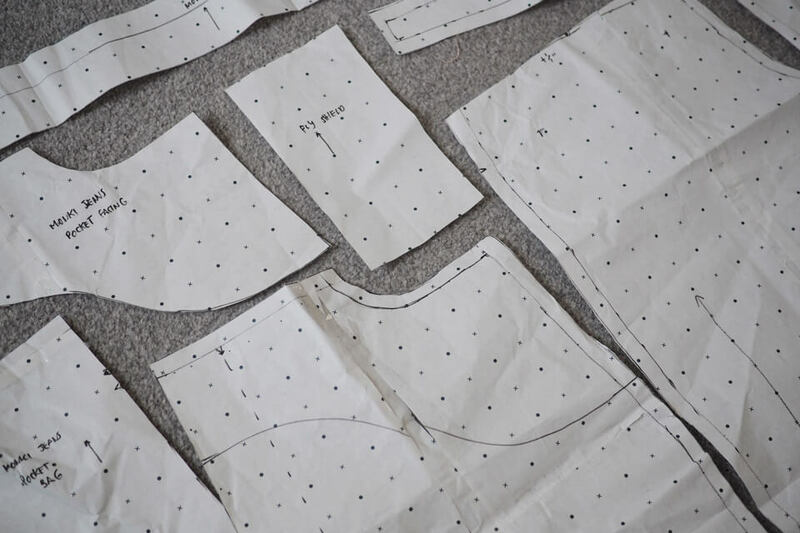 Getting inspired here :) I love to read about the sewing process also. Clothes from self drafted or copied patterns feel extra satisfactory when they turn out well. And it is nice to learn tricks from store bought patterns then use them on your own patterns! Thanks! Yes it was fascination unpicking the RTW jeans – they are very sturdy! I did something similar a few years ago. 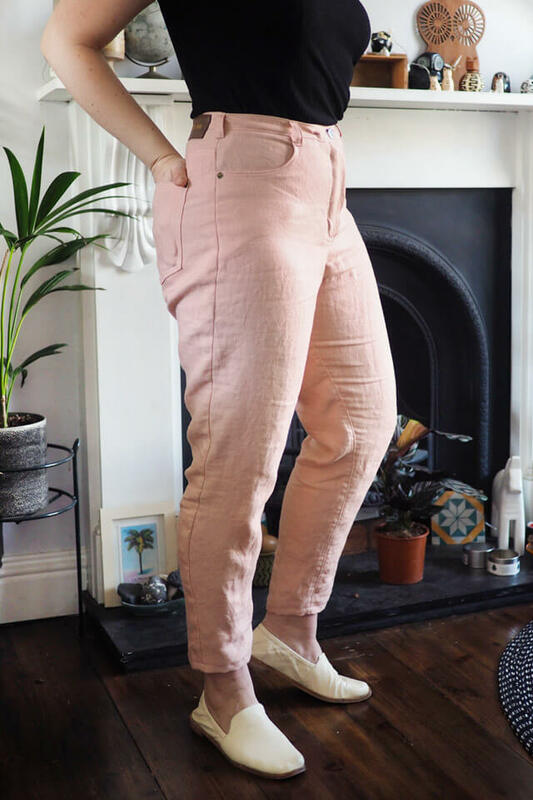 I took the Craftsy Jean-ius class and copied an old really baggy pair of jeans. Since they were such a mess I got the grain lines all wrong but the crotch area fit. So finally I transferred my changes to a Closet Case Morgan jeans pattern and made them. I’m really happy, and I bet I can changed my muslin to a mom style, instead of the Morgan jeans boyfriend style. Yours are so gorgeous, and I’m sure you will love them. I love all the professional details you put into them, they look so much better than any you could by RTW. I will try to find some linen in the US, if not, will bite the shipping bullet and order from NZ. Thanks so much for the post, they are lovely, (as is your little helper). Oh I forgot, try to use water soluble stabilizer for the buttonholes. It works beautifully and the little bits left behind wash out. Great idea to convert changes onto an existing pattern, I almost dug out the Ginger pattern to compare these to which would probably save a lot of truing up. Thanks for the stabilizer tip too, I’ll look out for some. Thank you! I love seeing gratuitous guts shots too, haha. Really pleased I made myself go slowly on these! They look awesome and fit you perfectly! That’s a very cool looking pattern, hope they go well! 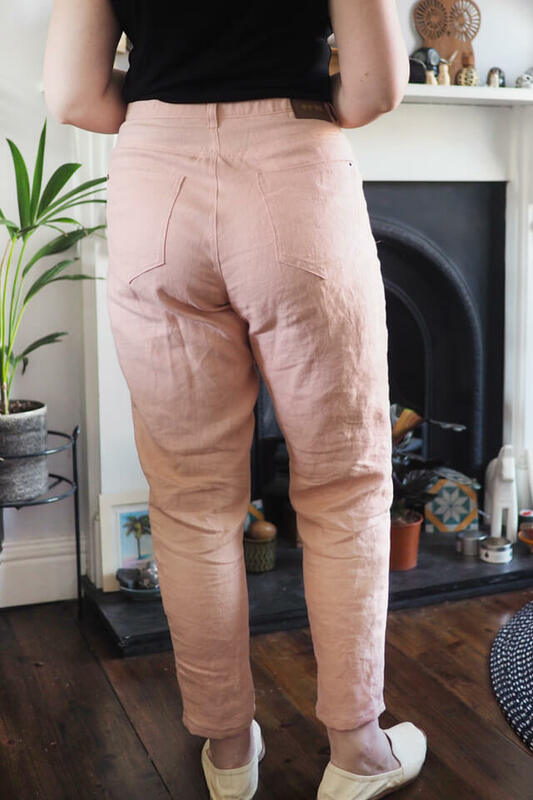 I am in awe of your momentous effort to get these ‘Mom’ jeans to such a professional finish! 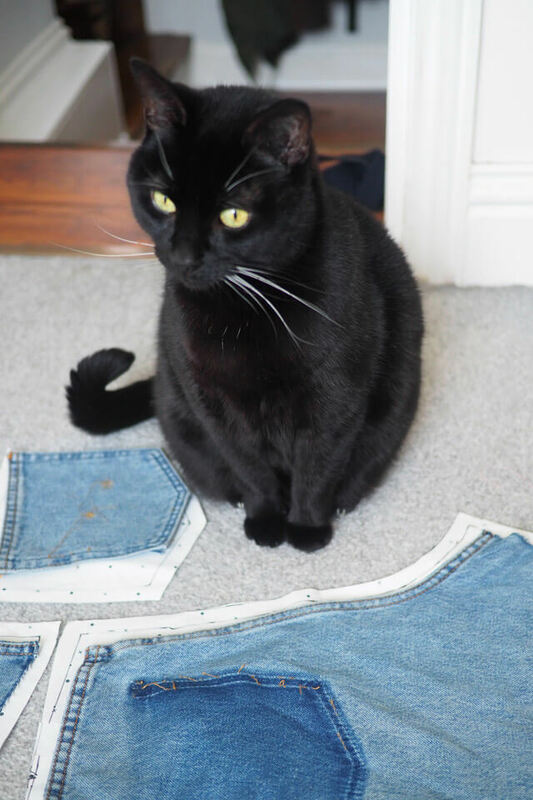 I especially love the description of the ‘Mom'( for Aussie me, ‘Mum jeans ‘ as I have been struggling adapting a bought pattern for the same task! 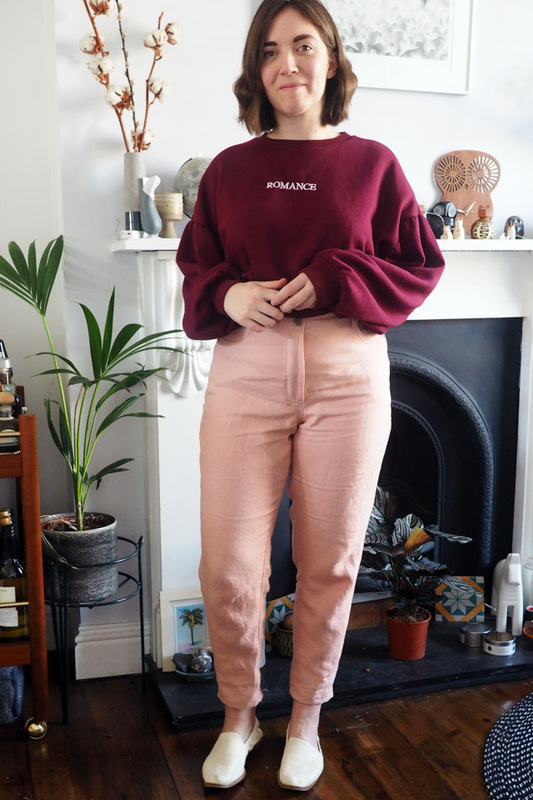 Bring on more Mum comfy clothes! Great blog! I am not a jeans wearer as I am not keen on the image of blue denim but I do like yours and am very tempted to give them a go! WordPress, thank you ever so for you post.Much thanks again. These look beautiful! One technique I recently discovered for copying patterns (without having to sacrifice the original) is using painter’s tape to cover each piece, then trace and peel off! Here is a video of Adam Savage demonstrating the technique for a costume he wanted to copy. I’ve used it twice now and it’s worked really well. Ahh, I heard of this a while ago, I can totally see it working! Great idea if you don’t want to sacrifice an original. Thanks for the reminder and link. So impressed! They look terrific. Clever lady you are! Good work, a Western shirt sounds complicated. I agree it’s a great way to get things that are very likely to fit and be very much worn and loved, as they’re already tested! Katie these are amazing!! 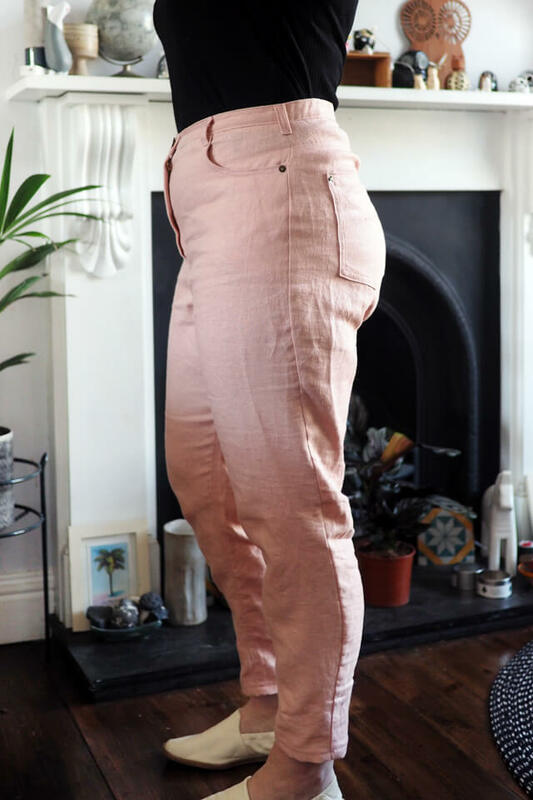 So much work and thought has gone into them and they are dream trousers. 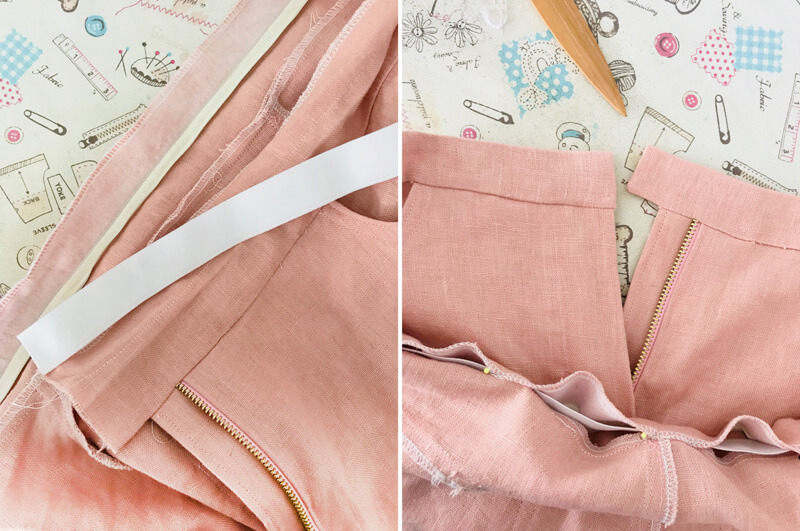 I’m also a little bit obsessed with blush pink as a neutral at the moment and have some of this very same linen on the list for my next order! This post just reminded me that I have the Jean-ius! with Kenneth D. King class on Craftsy that I have done yet. You’ve inspired me to sacrifice a pair of my old jeans too. Brilliant! 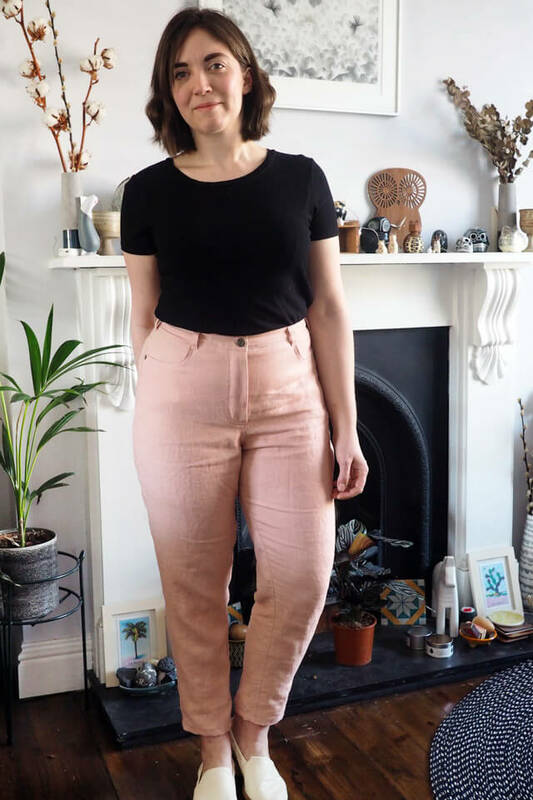 OoooOoo these self-drafted jeans are BEAUTIES. 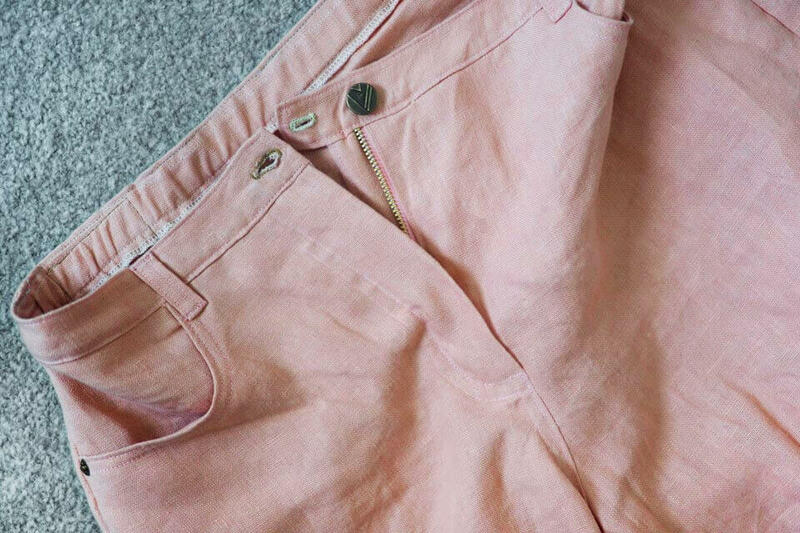 That shade of pink looks like the avocado-pit color some dyers get – fresh but earthy, and so good with the dark hardware. Really impressive and inspiring! Yes, it reminds me of avocado pit pink too! Thank you. This looks gorgeous. Love your work, Katie. It looks like professional work. If that doesn’t work it may be possible to trace off and mail you a copy, yes. Hi Katie, I’ve tried the M7754 and it’s just not a good match. The waist comes up way too high in the front and the proportions are not quite right for the Mom jeans look (way too baggy in the front crotch area). If you don’t mind, I’d really like a copy of your paper pattern. I’m willing to compensate you for this tremendous favour!